Kenny still can’t make sense of his birthday gift, the titular power cube. On top of that, the secret agent lady is holding a gun on him. Kenny retaliates by creating Power Blaster, a battle-bot with Tick-like zeal for protecting his creator. 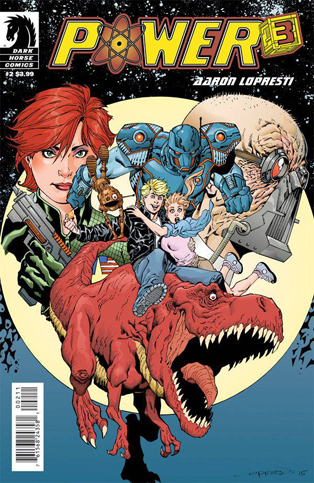 So yes, the action in issue #2 is even more fast-paced than #1, as Kenny has to make every decision in the moment (like turning the T. Rex back into a staircase.) Kenny’s teenage mind is blown by dad’s reveal of his being a fugitive alien. Dr. Cruel, not surprisingly, is still pissed at the world, and offs one of his henchmen in a fit of rage. 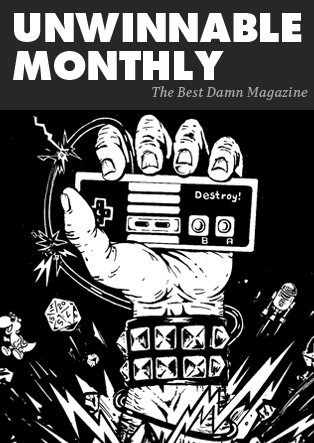 If you haven’t read issue #1, pretty much everything I’ve written sounds insane and/or made up. But really, do yourself a favor and check out Power Cubed. The exposition is a bit hammy (probably intentionally) and makes most turns of event convenient (Kenny: “You honestly expect me to believe this?” Dad: “I think the cube substantiates my story.”) but the fun in a book like Power Cubed is in the visuals and the zany action, which doesn’t slow down from cover to the final page teaser for the next issue. Aaron Lopresti is on art and story again, and for the whole of the mini-series. My awareness of the impending release of this series was very recent. In fact, I think it was last week. I learned from a preview on another site that Vertigo was going to launch a bunch of new series boasting phenomenal creative talent. This is exciting, as I’ve always been a huge supporter of DC’s Vertigo imprint. That and the fact that with this issue Gilbert Hernandez, Darwyn Cooke and Dave Stewart are collaborating on a comic together! This issue does not disappoint, it’s a fine introduction to this miniseries that successfully introduces a number of main characters, while also fleshing out the seaside town itself and providing us with a spooky introduction to the apparently supernatural events that are occurring. A beautiful mysterious naked woman appears on the shore of an unnamed town in the first panel. We can guess that she somehow factors into the appearance and disappearance of a mysterious moon-like sphere in the ocean, in apartments, in caves and seemingly wherever else it pleases. This is not the fictional town of Palomar from Hernandez’s fantastic Love and Rockets series, it’s something else entirely. There is something familiar about this place too though, mainly in Hernandez’s strengths as a writer of characters and of place. As the issue pans out we are given brief and effective introductions to a number of characters, especially the tragic character of Bundo. The town drunk, he interacts the most with the children who possibly have become the aforementioned Twilight Children of the title. We are also introduced to Tito, Nikolas and Anton, three characters whose story could potentially be the focus of another series. Instead their backstory provides as a fine layer of depth and realism to this world. 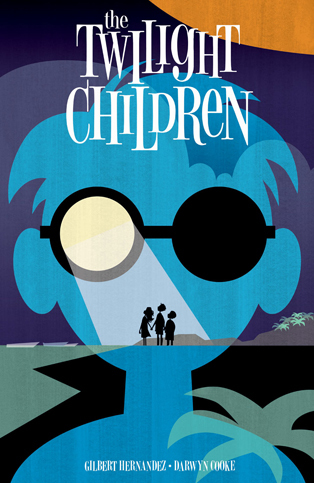 Darwyn Cooke’s art is fantastic as always. I have seen a black and white preview for this series that really showcase just how amazing Cooke’s artwork on this issue is on its own. There are a number of instances in this issue where a facial expression or physical gesture suggests so much about a character, especially in the introduction of the female protagonist Tito, and her body language during her separate interactions with Anton and Nikolas. Not only that but the dynamic of the town, from Bundo’s primitive isolated shack on the beach to the thriving streets inland. Dave Stewart’s colors add even more depth to Cooke’s art. There’s a scene with Tito and Nikolas where his use of blue shows her sadness and isolation. With a series that takes place in a fictional world not unlike our own, Stewart’s bold colors help add that layer of magical realism, because let’s not forget about that sphere that seems to have taken over the minds of some kids. A really great story is one where you could isolate one element of many and make that into its own great story. Add all those elements together and you’ve got magic. This series so far is doing that, and hopefully is just a sign of wonderful things to come from Vertigo Comics. Note: This review is a little late. I’ve been busy the last couple of weeks with New York Comic Con and life in general. That said, I really wanted to write a wrap up review of this miniseries since I’ve pretty much reviewed every issue since issue #1. Without further ado, here we go! As Lando #5 ends, I realize that there are so many more stories to tell with this character. I feel that with with more comic adventures we can see his transformation from being a full on scoundrel to less of a scoundrel occur, something that we see more or less happens to Han Solo over the course of the original trilogy. By the time of Empire Strikes Back we get the impression that Lando is a character with a lifetime of adventures behind him, at the time of the movie playing the role of Baron Administrator of Cloud City. We know that he’s bluffing, that at his core he wants to do right, but also make a few credits along the way. This issue sees many unfortunate things happen to Lando’s crew. The Sith artifacts introduced earlier in the series corrupt the clone warrior panther aliens Aleksin and Pavol, and even Sava Korin the Ugnaught professor falls victim to the corrupting influence of the Sith. Fortunately it turns out that Bounty Hunter Channath Cha is an old ally of Lando’s, and likely a former romantic interest of Lobot, that sly old dog. Her help will be needed, as two cloned elite warriors armed with lightsabers are bearing down on them. Fortunately with a little help from his friends, and a lot of that bluffing that he does so well, Lando manages to pull ahead. Unfortunately he does with great losses. The resolution of this issue and this series is somewhat melancholy. We see a bunch of underdogs achieve a little piece of success, and it looks like this score may go their way. Unfortunately there are powers greater than them at work, both physical and mystical. These powers ultimately undermine them, and at the end it can be summed up as one big loss. Even Lando comes out of this a changed man, because while he’s used to taking losses he’s not used to ultimately losing. By the end of this issue he essentially loses the score and a good friend, and that friend tells him that maybe it’s time to change his ways. While this series does not give a ton of internal insight into Lando the character it does present us with a few enlightening things about him, and even into the average denizen of the Star Wars universe. It also answers a big question I raised in an earlier review. In issue #4 (which I didn’t get a chance to review), it’s revealed that Lando always thought that the Jedi were kind of a scam. This makes some sense, as it suggests that perhaps the Imperial propaganda machine was at work corrupting the Jedi influence in the eyes of the general public. Also Lando was always working against the law in his youth, so why would he hold a group of mystical cops in high regard, or even believe their mysticism? We’re also given a starting point on the path for Lando to end up where’s he at by the time of Empire Strikes Back. There are still many questions though: What about him and Han? Will we ever see his days as the original owner of the Millenium Falcon? How does one rise to power in Cloud City? No Battle of friggin’ Tanaab?! Are there more “Lobot The Ladies Man” adventures in the works? 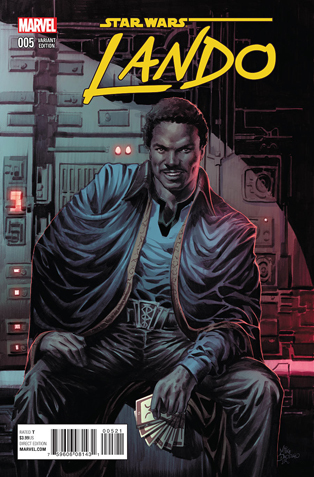 Hopefully for now more Lando miniseries are in the works to answer these and many other important questions. As for this one it’s a fine Lando adventure that takes place at a turning point in the character’s life. We’re given some insight into how this galaxy far, far away works, and how it’s not the best place to be if you’re an underdog just trying to score a little slice of your dreams.